DAWSON, SIMON JAMES (baptized James Simon), surveyor, engineer, office holder, and politician; b. 13 June 1818 in Redhaven, near Portsoy, Scotland, tenth child and eighth son of John Dawson and Anne McDonell; d. unmarried 30 Oct. 1902 in Ottawa. Most of the Dawson family immigrated to Nepean Township near Bytown (Ottawa) in 1836, though Simon James Dawson appears to have remained in Scotland longer. Several of his brothers found work in the Ottawa valley lumbering industry; during the 1840s Simon was employed by Gilmour and Company, first in the Pembroke region and then on survey work near Peterborough. By 1851 he had entered the Department of Public Works and was stationed at Trois-Rivières. His years of service with French Canadian work-crews and native boatmen gave rise to an understanding that he was to express later in regions far removed from Lower Canada. 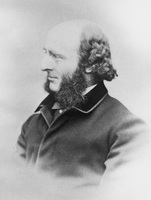 It seems likely that his early government appointments were secured through the influence of his brother William McDonell Dawson, superintendent of the woods and forests branch of the Crown Lands Department and later a member of the Legislative Assembly, who was closely tied to the Toronto business group then urging westward expansion. The appointment most crucial to Simon Dawson’s career was that of surveyor to the expedition being organized by the government in 1857 to explore the country between Lake Superior and the Red River. George Gladman* was named director of the enterprise, and geologist Henry Youle Hind was to conduct scientific studies en route. Disputes among the principals led to the dismissal of Gladman the following spring and to the splitting of the organization into two autonomous divisions, one headed by Hind, the other by Dawson. 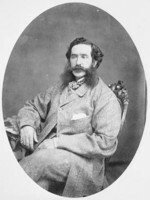 When their reports were tabled in the assembly in 1859, it seemed clear that Dawson had adopted a much more sanguine view of the economic potential of the region than either Hind or John Palliser*, head of the British exploring expedition that had traversed the same ground in 1857. Dawson proposed a route to the west different from that advocated by Hind and the expenditure of considerable amounts of public money to build wagon roads over various portages and to construct locks at Fort Frances (Ont.). His proposal was designed to make maximum use of navigable waters, to prepare the way for a railway linking east and west, and to forestall any move northward by aggressive American interests. But the size of the expenditures he advocated doomed Dawson’s project for the time being. Only after confederation did the Canadian government reconsider the merit of a road to the Red River, and place Dawson in charge of construction for the segment from Lake Superior to Lake of the Woods. The section from there to Upper Fort Garry (Winnipeg), along the route originally recommended by Dawson, was assigned to John Allan Snow*. 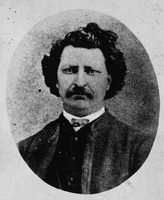 The slow pace of 1868 quickened suddenly the following year with news of Métis resistance at Red River [see Louis Riel*], and Dawson was ordered to hire a larger work-crew (more than 1,000 men by the early months of 1870) and to expedite the passage over the route of a military force led by Colonel Garnet Joseph Wolseley*. Wolseley’s men inched their way west, contributing more than 5,000 workdays to completion of the roads and bridges necessary for their passage. Within a year, an emigrant transport service had been established under the auspices of public works, and settlers for the prairies were moving over the road named for the man who had selected it, had supervised its construction, and was serving as its superintendent. It would have been equally appropriate to have given his name to the village at the Lake Superior end, which owed its existence to what was, for a few years, the only Canadian route to the prairies. But Wolseley had already dubbed the settlement Prince Arthur’s Landing; it later became Port Arthur and, still later, part of Thunder Bay. The brief importance of the route and Dawson’s involvement in the negotiations preceding Treaty No.3, with the Saulteaux of the Lake of the Woods region [see Alexander Morris*], brought him some national recognition in the early 1870s, but his association with the village that became his home was far more enduring. Caught up in the rapid growth of Prince Arthur’s Landing, in mining ventures that seemed to promise wealth, and in local projects such as the building of St Andrew’s Church (Roman Catholic) under Father Richard Baxter, he was shocked to observe the direction of government policy as it affected the area. His plans for development at Fort Frances had been scuttled when it had been decided that the proposed transcontinental railway would run well to the north of this village, and there was a danger that Prince Arthur’s Landing would be bypassed as well [see Thomas Marks*]. This concern led Dawson to resign as superintendent of the Dawson Road and go into politics. He represented Algoma, which included all of present-day northern Ontario, in the provincial legislature from 1875 to 1878, and then in the House of Commons from 1878 to 1891. 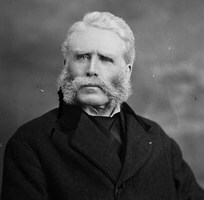 Fierce disputes over the route of the Pacific railway had created pockets of hostility to each of the established political parties within the Lakehead area, so he had decided to run initially as an independent. In Toronto he almost invariably voted with the Liberal government of Oliver Mowat; in Ottawa he became such a staunch supporter of Sir John A. Macdonald* that most of his contemporaries forgot that he remained nominally an independent until 1887. 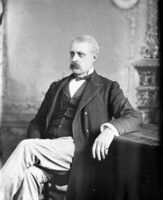 Dawson’s years in the Ontario legislature were marked by florid speeches on the future of the north and by his increasing sense of alienation from the interests of his fellow legislators. He tried unsuccessfully to educate them on the history of the north and its traditional links with Quebec rather than Ontario. In the commons he developed more fully his idea of a separate northern province that would serve as a bridge, not only between Ontario and Quebec but also between the old east and the new west, then opening up for settlement. Dawson shared with Macdonald and representatives of other provinces a deep concern about any augmentation of Ontario’s territory beyond the northern boundary understood in 1867, the height of land between the Hudson Bay and Great Lakes drainage basins. He was therefore eager to prevent any of the newly acquired Hudson’s Bay Company lands from being added to an already dominant province. 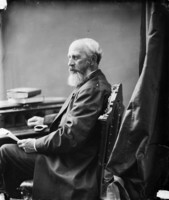 In 1880 Dawson served as chairman of the commons committee set up to investigate Ontario’s claims, as recognized by a board of arbitrators in 1878, to the land further north (to the Albany River) and further west (to Lake of the Woods). But the ultimate decision lay with the Judicial Committee of the Privy Council, to which the boundary question was referred. Ontario won its case, in 1884, and Dawson’s dream of a separate province was at an end. So too was his prominence on the national scene. Even in his own riding, there was an increasing tendency to regard him as irrelevant. The eastern part of the riding had never been caught up in the boundary dispute and had always mistrusted his Catholicism. His age also told against him, as did his role in creating a route now superseded by the Canadian Pacific Railway; in 1889 the News in Rat Portage (Kenora) dismissed him as an “old fossil.” More important was his identification with causes, no matter how significant they would become, that won him few votes in the Algoma of the 1880s. His promotion of bilingualism in the North-West Territories, over which he clashed in parliament with D’Alton McCarthy*, was unpopular. Areas as remote from each other as Manitoulin Island and Rat Portage protested his support for Indian fishing rights and his interventions on behalf of natives in the business of the Department of Indian Affairs. It is appropriate that his memory survives among northern Ontario natives, who still recall a sympathetic spokesman whose power was insufficient to shape policy. Dawson lost the Conservative nomination in Algoma for the election of 1891. His political career ended when his efforts in 1891–92 to secure a Senate seat all failed. He subsequently spent an increasing amount of time in Ottawa, where he died in relative obscurity in 1902. [Simon James Dawson’s publications include Report on the exploration of the country between Lake Superior and the Red River settlement, and between the latter place and the Assiniboine and Saskatchewan (Toronto, 1859) and Report of the Red River expedition of 1870; reprint, with remarks on certain strictures published in England by an officer of the Expeditionary Force (Ottawa, 1871), as well as several other reports on the region, which are cited in Canadiana, 1867–1900. AO, F 1008. GRO-E, Portsoy, Roman Catholic reg. of baptisms. NA, MG 26, A; MG 29, C67; RG 10, CI, 3, Dawson, corr. with Lawrence Vankoughnet, esp. Vankoughnet to Dawson, 7 Dec. 1880; 3, Vankoughnet to Donnelly, 16 Nov. 1886; Vankoughnet to McIntyre, 18 July 1887; Robert Sinclair to Macdonald, 11 April 1883. Daily News (Port Arthur [Thunder Bay]), 19 March 1912. Daily Times-Journal (Fort William [Thunder Bay]), 6 Dec. 1902. Fort William Journal, 1887–91. Globe, 1875–91, 1 Nov. 1902. Ottawa Evening Journal, 2 Nov. 1902. Thunder Bay Sentinel (Prince Arthur’s Landing, later Port Arthur), 1875–91. Weekly Herald and Algoma Miner (Prince Arthur’s Landing, later Port Arthur), 1882–91. 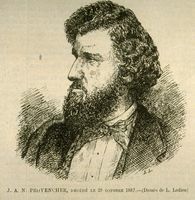 M. E. Arthur, “The frontier politician,” Aspects of nineteenth-century Ontario . . . , ed. F. H. Armstrong et al. (Toronto and Buffalo, N.Y., 1974), 278–96. Can., House of Commons, Debates, 1878–91. Morns, Treaties of Canada with the Indians. “Newspaper Hansard,” 1875–78. Elizabeth Arthur, “DAWSON, SIMON JAMES,” in Dictionary of Canadian Biography, vol. 13, University of Toronto/Université Laval, 2003–, accessed April 20, 2019, http://www.biographi.ca/en/bio/dawson_simon_james_13E.html.